Campaign for the American Reader: Pg. 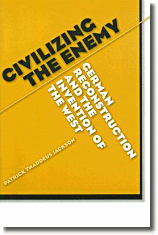 69: "Civilizing the Enemy"
Patrick Thaddeus Jackson is Associate Professor of International Relations in American University's School of International Service and author of a recent book, Civilizing the Enemy: German Reconstruction and the Invention of the West. For the past century, politicians have claimed that "Western Civilization" epitomizes democratic values and international stability. But who is a member of "Western Civilization"? Germany, for example, was a sworn enemy of the United States and much of Western Europe in the first part of the twentieth century, but emerged as a staunch Western ally after World War II. By examining German reconstruction under the Marshall Plan, author Patrick Jackson shows how the rhetorical invention of a West that included Germany was critical to the emergence of the postwar world order. Civilizing the Enemy convincingly describes how concepts are strategically shaped and given weight in modern international relations, by expertly dissecting the history of "the West" and demonstrating its puzzling persistence in the face of contradictory realities. Civilizing the Enemy has earned endorsements by such eminent scholars as Nicholas Onuf and Peter J. Katzenstein. Page 69 of Civilizing the Enemy opens with a diagram, one of four in the book designed to graphically illustrate the relationships between the rhetorical elements that compose political positions on postwar German reconstruction. That specific diagram represents the position of the German Social Democrats, and indicates two important things. First, the centerpiece of the Social Democratic position was the notion of 'European socialism,' which showed up in arguments that a reunified Germany would be a powerful force for propelling the continent towards the Social Democrats' preferred socio-economic condition. Second, the Social Democrats did talk about the question of whether Germany was a 'western' country, but preferred to keep such discussions confined to the sphere of culture; Germany's 'western' status did not have the same implications for them as it did for their Christian Democratic opponents. The Christian Democrats, whose argument is discussed on the bottom of p. 69 and diagrammed on the following page, placed the 'western' character of Germany closer to the center of their considerations, and drew from this the political conclusion that Germany had to be allied with the other 'western' powers -- even at the cost of prolonging the division of the country. In a way, this encapsulates a very important part of the book's overall argument: the most important distinction between the Christian Democrats and the Social Democrats, at least on matters of foreign policy, involved the question of whether Germany should be allied with the United States, Britain, and France and opposed to the Soviet Union -- and this question was intimately intertwined with a series of reflections on German identity. It was not primarily a question of economic or military interests, although both economic and military concerns were introduced into the debates; rather, it was a question about cultural identity and the political implications of that identity. Hence, explaining how one position triumphed in Germany during postwar reconstruction means exploring the ways that the different parties struggled to control the meaning of German identity, and in particular how they sought to mobilize this notion of 'the West' as they did so. But in another way, page 69 is completely unrepresentative of the rest of the book. German debates about postwar reconstruction make no sense without embedding them in the context of the military occupation of Germany, and in many ways the most important debates about Germany's future took place not in Germany, but in the United States -- in part because the occupation of Germany was largely an American affair. Germany's role in the postwar world would depend to a large extent on how American policymakers conceptualized Germany and its identity, and a good deal of the book is devoted to tracing those debates. What is most striking about these debates is that they involve the exact same rhetorical commonplace -- 'the West' -- functioning in similar ways, as one side (the "vindicationist" or "America should be actively involved in world politics" position) deployed the notion against the other (the "exemplarist," or "America should withdraw from the world and keep its institutions pure" position) in an effort to seize control of the official articulation of the country's identity. Page 69 is also unrepresentative to the extent that it is a very static representation of two political positions. I use that static representation as a guideline for the more dynamic, messy historical narrative that takes up the bulk of the book; the specific examples that I cite flesh out that bare-bones sketch on p. 69 and add a temporal dimension to the analysis. And three pages later, on p. 72, I begin a longer historical account of the notion of 'the West': where did this peculiar bit of political rhetoric come from, and how did it acquire such evocative power? I sketch the history of 'civilizational thinking' and discuss such transmission mechanisms as the "Western Civ" course that was a mainstay of American higher education for several decades in the twentieth century. In this way, we can begin to understand how a notion like 'the West', which is a comparatively recent notion (no one really talked about 'the West' in the modern sense until the middle of the nineteenth century), came to occupy such an important position in debates about postwar German reconstruction. Many thanks to Patrick for the input. Click here to read the Table of Contents and Preface to Civilizing the Enemy. Click here to learn more about Professor Jackson's scholarly interests and recent publications. Last week Patrick wrote an excellent blog post explaining what one of his typical weeks of work in the university--albeit a week where he left out the weekend work hours and in which he had no grading to do--looks like. Do have a look. Earlier this year he wrote a very interesting entry here on the blog about several works of fiction that might help us imagine what life is like in a theocracy.